This is a one pot meal so, you can prepare this directly in the cooker. Heat the cooker pan, add oil. Do tampering according to the order of ingredients mentioned above. Note : fry kalachana for few seconds till it becomes crisp, dals should turn golden brown. Add Chooped onions, sautéed till they are translucent. Sambar powder, tamarind juice, salt goes next into the pan. Water goes next. Bring it to boil on high flame. Taste the water, adjust flavors accordingly using jaggery/salt etc. Fry Rice in a wide skillet till it is slightly bowned, and let it cool. Wash it. Add it into the boiling water. Cover the lid of the cooker and cook in medium flame for 3 whistles. Frying the rice makes the rice grains fall apart. I have never been able to submit any photos in time for CLICK or I must say I lack creativity while I take pictures. I am sending my lamp under the name 'Nanda Deepa' which means a lamp which gives light 24*7, 365 days nonstop. Usually ever house has a lamp which they worship, here is our lamp for 'CLICK'-Metal event. What does it mean when you say "warm the rice"? 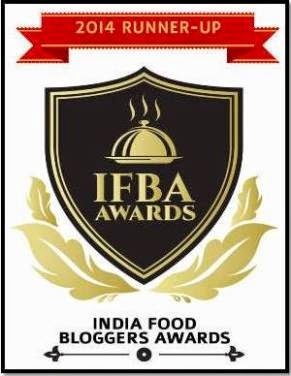 oh cool... ur hubby can cook;) K makes wonder alu gobi and black channa biriyani. he makes one of the best tomato rasams too. by the way, some links on top horozantal bars are not working. donno if u already know it. just thought i'll mention abt it. Thanks girl. Try it out sometime. You can heat/warm/fry..till the rice changes its color. It makes the grains fall apart when you cook rice. However I have changed the line in the recipe to make it clear to the readers. Thanks for droping by. Thanks girls. This is my first entry to Click n wanted to click something nice. yeyeyeye....gooood. That will keep you sometime out of the kitchen... Whenever I am down with fever or late from office, R cooks. But I know his menu well.. :D About the links in horizontal bar, yes few are not working coz I am still working on them. Will activate them soon. Thanks for pointing it Sia. That reminds me to ask you many more questions.. :P will mail you later. You had me at 'tangy & spicy' - the best combination. Looks good. Yummy Rice! The click is so good. So auspicious. We call it 'Akhanda Deepam' in Telugu. the rice looks great... nice click entry.. 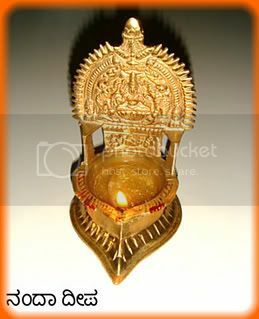 Most of SouthIndian homes have this lamp, they are auspicious as Uma has said. Ya, coz they make once in a while and very few things the dish has to taste great. 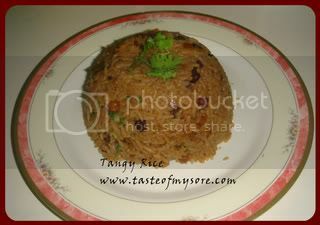 :D Tangy & Spicy is the word for this rice coz that is how my hubby likes to have it!! Thanks girls. Rice tasted really good. I loved the click..we call that lamp as 'kamakshi amman vellaku" ..considered very auspicious. Hey thanks for stopping by my blog . Me too from karnataka and we call it baathu in hassan.yummy . As for the click, it looks great. We light the same type of lamp at home...it is said to be really auspicious..infact we have gifted the same to most of our friends.